Keep safe and stylish! 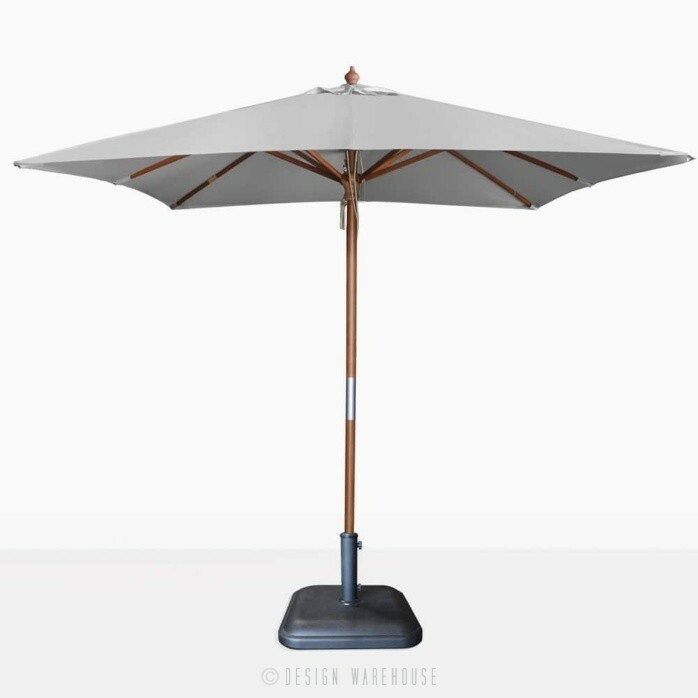 The Dixon Sunbrella Square Umbrella in Graphite is the perfect choice whether on a modest patio, a large deck or lined alongside a pool in a commercial property. 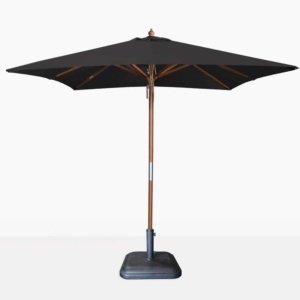 The Dixon Square Umbrella can cater to most spaces! We know you love quality and options, so we have available 4 colours so you can complement your space according to its needs! Not only that, but the classic, stylish Dixon range of Sunbrella Umbrellas also come in round! 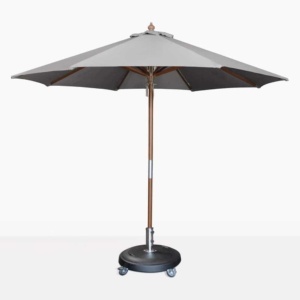 Place the Dixon Graphite Sunbrella Umbrella in 2.5metre size in a small Round Pedestal Table, with a couple of Kensington Arm Chairs for a divine setup for lovely breakfasts with your favorite person, or casual meals watching the sun go down. Perhaps you are designing for a day spa and need to set up an outdoor area in the shade. Why not try a couple of our cushy Aaron Chair in Java with Taupe Cushions, a matching Ottoman and a 3 Graphite Sunbrellas?! So comfortable, the guests won’t wish to leave! These beautiful classic umbrellas are easy to look after, clean and store. A 2.5 metre easily fits in the boot of your car for those family trips to the beach, while the large 3 metre can be tucked away without taking up much space until the bright, summer months! 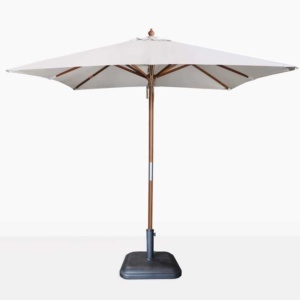 Try a 3 metre Dixon Square Sunbrella Umbrella in the middle of a Capri Oval Double Extension Table, which expands without moving the umbrella hole! Surround with Bruno Chairs in Taupe and you have a beautiful, timeless look you’ll be thrilled with! This Dixon Sunbrella brolly is constructed out of a strong frame, simple pulley system and a canopy made out of durable, hard wearing, fade resistant Sunbrella ® fabric, you’ll be thrilled with this glorious umbrella that lasts and lasts! If you have any questions about this classic umbrella or any of our other fantastic products; call in or call up! Our sales assistants are in store 7 days a week to help you find the best possible furniture for your great outdoors!